That was amazing! As you guys, Junji Ito is by far one of my favorite mangakas. It was great to see his studio and how he works. Btw, do you guys have any news related to Junji Ito? Like new stories or movies? Thanks to Bharath for sharing this! @Okada: Glad you enjoyed it! I sat rapt with attention and was hanging on every word Ito said (and trying to catch extra straps from the Japanese exchanges between Ito-san and the interpretor). @Okada: PS, worth noting that Bharath did hang out with Shintaro Kago on his most recent trip to Japan! @Ryan: Hm.. so if really got a child, this might explain we have not seen new works of him recently. About that last collection released, I guess some have scanlated the first chapter. @anon: Yeah, I saw that comic but it was like.. ehhh. harlan ellison AND ito reference and still not funny? thank you posting that wonderful interview! Ito is one of my favorite manga artist, i always wondered what kind of references he used for his art work. @GISM: All the thanks go to Bharath & Alka for putting the interview together and posting it... go over to their site and leave a comment there! I agree, seeing how he work was very exciting for me too! Very unique interview, casual and laid-back. Who wouldn't want to have a kitchen table conversation with him about Japanese urban legends and horror? If anyone else is seeing that the video freezes at around 10:00 minutes or so, it comes back at about 11:30. Junji Ito is as for you for me too one of my favorite mangakas.Thanks to Bharath for sharing this! 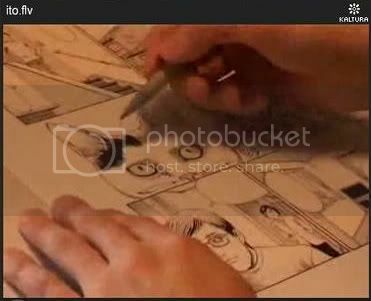 Can this be possible this is 20 more years ago I first time saw the Junji Ito awesome drawings? I am feeling simply cursed with them like when I saw the famous Munch painting in my 6. Can´t characterize that work with another word than simply great! Seeing things I like when read in old legends and contemporary fantastic stories drawn as Junji Ito works is for me near to be like miraculous(^^).I regret I can´t set a friendship with him. Shame for me I did not learned japanese more through all the years. If my great-grandmother did not traslated for me K.Nakazawa Hadashi no Gen when I was young but learned me to do by my own...or wanted me to speak with her japanese friends...Anyway. But read Junji comics with english translation is also good. The fact there is perhaps no new comics from him is sad but if they got a child, I can fully understand this. I wish the family everything the best. Is possible to download the video from somewhere? It freezes. BTW. Will be there some pictures of the family? I would show them to my girlfriend thinking such comic artist to be raving lunatic unable to keep lifepartner and family. And me from that point moron unsuitabe for her... for long years. @David: Thanks for the comment and for getting in touch! We all love Junji Ito too, so we're indebted to Bharath & Alka for sharing this exciting video. If you are interested in a digital copy or more information, I suggest you ask him over on his site (linked from the post). 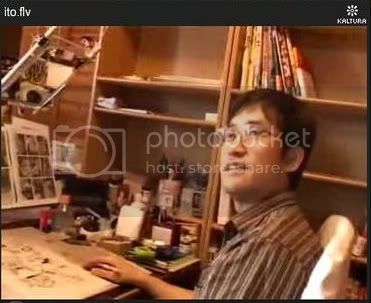 There is a photo of Junji Ito and his wife floating around, from their wedding. She looks a little goth and very pretty, as I remember. The newest thing by Junji Ito I had seen is Frankenstein. I borrowed english translation of that from my friend for a day about month before. But I forgot check the issue date. I have heard of Black Paradox but I still do not have. Please, should I ask You for something about Junji Ito comic character Tomie? I think she is brown-eyed, like all the dark haired Japanese women. My friend thought she do have just BLUE eyes, like buddhistic Godess of fortune and wealth. Because Tomie behaves the same way like the woman hero of old buddhist legend, who seduced 360 monks for their sins. And made them to kill from jelaousy. The survivors from the battle chopped her into pieces burying each separately. But she returned alive making all them just insane. And, he have Museum of Terror book vol.1 issued 26. July of 2006 yr. by Dark Horse. By his sight she´s blue-eyed on the cover. A misprint, or someone else have blue-eyed Tomie on cover of some Junji Ito comic book? What a color of eyes do Tomie have? Honestly, I am so confused as You. I had seen Tomie manga first time about twenty years ago. As a part of some Japanese comic book. The manga were B/W so I used to thought her eyes are greenish, like the Yamanba have. I know about three comic books containing color picture of Tomie and sometimes she´s blue-eyed, sometimes brown-eyed. Yes, she´s blue eyed on the book You mentioned. And I have buyed another Tomie comic book where on colored cover she looks ghostly with blue eyes and even blue hair. Sometimes blue-eyed, but mostly brown-eyed. Legend of her bloody revenge to monks inspired, in fact, also such things as Xena, painkiller Jane and more imperishable heroins:-) I hope Tomie movie 9 will show us more of her crafts. All the actress performing Tomie are brown-eyed. But, by my own experience naturally blue-eyed Japanese woman is rare to met. I like Junji Ito manga. His work is nice as fine art, it´s far above usual comic doodles. First filmed piece inspired by the mangakas I saw was Uzumaki, unfortunatelly, the movie was better B class:-( The comic was much, much better! I hope, they will film Valley of mirrors (my babyhood nightmare from Thousand and One Night Book, as a little child I was frightened our big mirror will crack and my face too after reflecting grimaces:-) and other comics. What about to ask directly the author, Ito Junji? I can't watch the interview. It should be there but it says: loading video. What am I suppose to do?